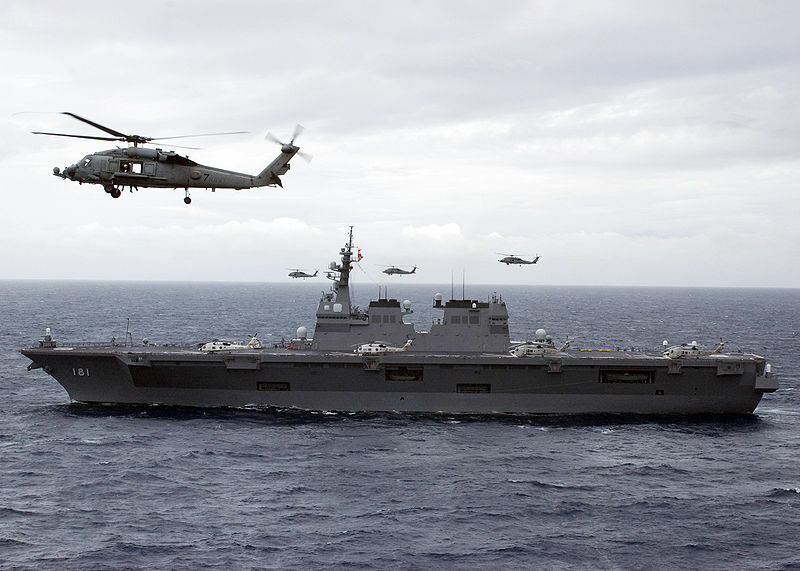 The Japanese helicopter destroyer JS Hyuga conducts training operations. A study by the Japanese government concluded that the country should bolster its marine forces and introduce surveillance drones in an effort to expand its naval forces to address emerging regional threats. The report, ordered by Japan’s Prime Minister Shinzo Abe, also proposes improving the country’s defenses against ballistic missile attack and expanding its offensive potential to strike against enemy bases. Because Abe’s party controls both houses of parliament, it is in good position to implement the report’s recommendations after the report is finalized in December. The report is the latest in a series of moves intended to expand the Japanese military. Earlier this year, Japan announced it would increase military spending by some $2.1 billion, largely to finance the acquisition of new missile interceptors and fighter jets. Aspiring sincerely to an international peace based on justice and order, the Japanese people forever renounce war as a sovereign right of the nation and the threat or use of force as means of settling international disputes. (2) To accomplish the aim of the preceding paragraph, land, sea, and air forces, as well as other war potential, will never be maintained. The right of belligerency of the state will not be recognized. In reality, Japan maintains a small military force known as the Japanese Self-Defense Forces (JSDF). But the composition of those forces remains a politically sensitive subject both inside and outside Japan, with the ruling Liberal Democratic Party and the opposition Democratic Party of Japan both asserting that Article 9 permits the maintenance of a military force for self-defense and advocating revision of Article 9 to make that point clearer. Leftist parties, though, argue that the JSDF is unconstitutional and propose dramatic reforms, such as transforming the standing military forces into something more akin to a national militia. The question of increased military spending raises the specter of an arms race in the region. The challenge—as the security dilemma model suggests—is that increased military spending by one country is often met by increased military spending by others. As a result, the efforts of one country—in this case, Japan—to improve its security position by increasing military spending and capacity may actually be undermined as other countries—in this case, China and North Korea—respond in a similar manner. Security is actually decreased rather than improved as a result. What do you think? Should Japan expand its military capacity in response to growing tensions in the region? Or does Japanese military growth merely exacerbate existing tensions? Take the poll or leave a comment below and let us know what you think. This entry was posted in Uncategorized and tagged arms race, China, Japan, military spending, North Korea, security dilemma. Bookmark the permalink.